There’s nothing better than getting your family out into the great outdoors. Encouraging your kids to become passionate about an outdoor hobby or activity is a fantastic way to keep them fit and healthy while exploring the world around them. Mountain biking is the perfect activity for your little adventurer. Children love getting outside, exploring the world and getting dirty. The best way to achieve all three at the same time is with mountain biking. From vast open landscapes with rolling hills to gorgeous forest trails, there is always something new to be discovered in the world around them. If you’re interested in getting your children into mountain biking, investing in a mountain bike is the first step. The following list features mountain bikes that are perfect for your child. I have also included a step-by-step buying guide to make sure that you have all the information you need to make a well-informed purchase for your children. If you’re looking for quality and durability, the Diamondback Cobra may be the perfect bike for you. The Cobra boasts a high tensile frame made from the highest quality steel, perfect for regular use, and resistant to regular wear and tear. The Cobra features a medium tension suspension fork, perfect for absorbing the rough bumps and holes experienced when riding along your favorite trails. The simple linear pull brake system provides powerful stopping power, ideal for those downhill rides. 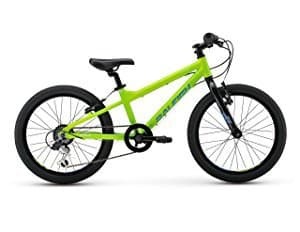 What's Great About It: The bike has a 21-speed gear system, which allows your child to tackle the toughest hills or race down the steepest slopes with relative ease and comfort. 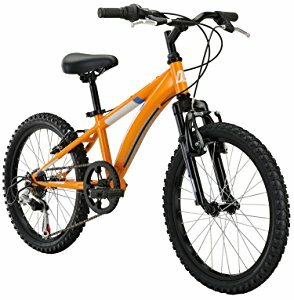 This bike provides your child with everything they need for a comfortable, safe and exhilarating mountain biking experience. If you’re looking for quality and comfort, the RoadMaster Granite may be just what you are looking for. The durable frame is produced using high quality rugged steel, providing support and comfort while remaining streamlined enough to reduce drag when travelling at speed. This comfort is maximized by the steel suspension fork that helps make your child’s ride as smooth as possible. Your child can set the bike to any speed they feel comfortable using the 18-speed SRAM twist drive, which allows your child to change gears easily and precisely. This gear system also boasts market-leading Shimano technology, making the gear changes quickly and as smooth as possible. 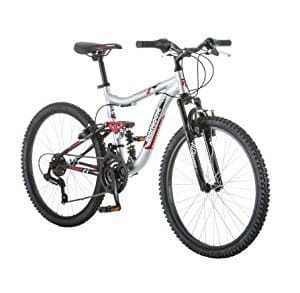 This bike offers a complete front and rear brake system that delivers solid results. The Granite Peak boasts full grip 24-inch wheels with a rough and rugged grip that helps make your child’s ride as smooth and as comfortable as possible. What's Great About It: Both alloy wheels are made using the highest quality steel which make this bike supportive and safe. The padded, rapid-adjustment seat provides absolute comfort, no matter what terrain you’re riding on. If your child is new to mountain biking, look no further than the K9 Kids Mountain Bike. The aluminium frame provides a firm foundation for this fully featured bike. The double disc brake system provides solid results, whether your child is travelling at their own pace or engaged in high-speed downhill races. Securely attached to this frame is an incredible 21-speed gear system, giving your child the ability to change their riding style, no matter what terrain is ahead of them. Despite being one of the lightest bikes on my list, this bike offers 20-inch wheels that provide outstanding grip on both roads and uneven surfaces. What's Great About It: The market-leading fork suspension system offers outstanding shock absorption alongside a padded, easily adjustable seat. 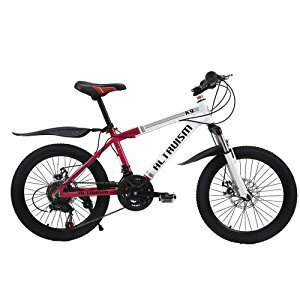 It is smaller than most mountain bikes, making it ideal for younger children or beginners. Your child can blaze some trails with the fully-featured Mongoose Ledge, which is specifically designed for girls but is suitable for boys too. The 24-inch wheels allow your child can safely traverse the most uneven surfaces and landscapes with complete comfort and ease. The aluminium frame holds a market-leading Shimano 21-speed gear system, which allows your child to completely customize their riding style. The gear system is fitted to an easy-to-use twist shift handle, so your child can safely change gears with ease. The lightweight design allows for easy transportation and maximizes your child's ability to gain speed while travelling downhill. What's Great About It: With an adjustable padded seat, safety and support aren’t compromised in this high-quality design. The Ledge 2.1 is extremely durable against wear and tear and will provide hours of enjoyment for your child, wherever they explore next. If your children are aged between 3 and 15 years old, whether they are biking experts of have never ridden a bike before, Raleigh is the brand for you. A market-leading mountain bike company, the Raleigh Rowdy mountain bike boasts high-quality framework and a full range of features to ensure your child’s mountain biking experience is the best it can be. Whether your child is riding around the neighborhood or exploring the great unknown, this bike is ideal. The lightweight aluminium frame provides excellent durability and support while the padded, quickly adjustable seat provides optimal comfort. 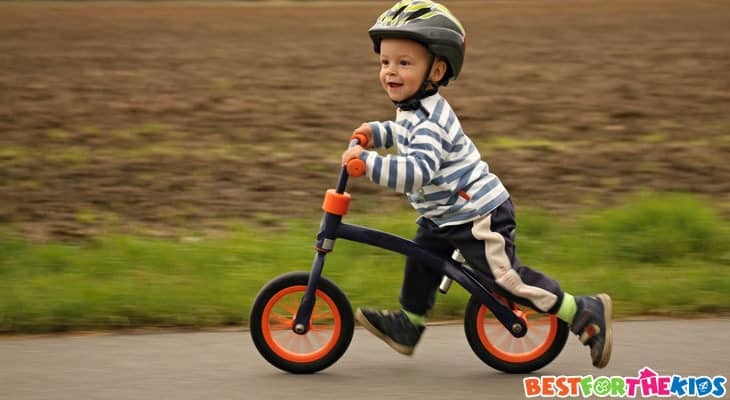 The single speed system makes this bike ideal for beginners, and the v-brake system makes sure that your child can slow down smoothly but solidly. What's Great About It: The 16-inch wheels provide stability and support no matter what track your child is traversing. There is also the option for extra 2-inch stability wheels, perfect for children who are learning to ride a bike for the first time. Shopping for the perfect mountain bike is no easy task, especially when it’s for your children. Whether this is the first bike your child will have or you have bought one in the past, follow my step by step guide below for everything you need to know about mountain bikes, so you can make the best purchasing decision possible. The bigger the wheels, the easier it will be for your child to go over bumps and holes comfortably. 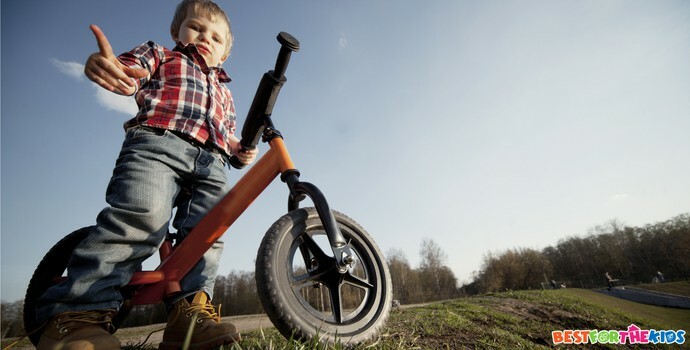 Most children’s bikes come with a wheel size from 15 to 28 inches. If your child can fit on a bike with 28-inch wheels, that is the best option. This will provide the maximum amount of support, balance and comfort for you child. Just remember that the bigger the wheels, the taller the bike will be. The performance of the brakes is one of the most important features on a mountain bike. If your child is descending a steep hill or comes face to face with difficult terrain, a solid braking system is vital. Look for a bike with a double disc or hydraulic system as they are the best brake systems available. These brake systems will provide solid results and will stop the bike extremely quickly if the brakes are applied. Educate your child on how to gradually apply their breaks for the smoothest and most comfortable stops. The cheaper the bike you buy, the cheaper the suspension system will be, and this will affect your child's experience on the bike. By investing in a mid-to-high range mountain bike, you can be sure that your child has suspension that will provide comfort and support no matter what kind of terrain they are travelling across. No suspension bikes will mean that your child experiences every single knock, bump and hole they cross and will result in an uncomfortable and unpleasant ride. Front suspension is a good mid-range option, providing a reasonable level of comfort and balance that will absorb most of the shock while travelling over small bumps. Full front-and-back suspension is best for you child. Every bump and hole will be absorbed, which will allow your child to have a fun and comfortable ride. When exploring your mountain bike options, one of the most important aspects to consider is the purpose of the bike. By defining this, you can easily refine your options when choosing the ideal bike. If your bike is mainly used on roads and smooth surfaces, you may not need full suspension or full grip wheels to achieve maximum comfort. If your child is exploring rugged terrain, these features will be essential. More in Kids' Bikes: What's the Best Balance Bike? The majority of mountain bikes these days come with twist gear systems that make changing gear extremely easy. However, this isn’t the case for all children’s mountain bikes. 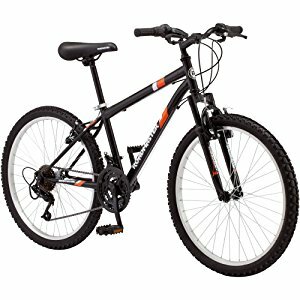 Mountain bikes will vary from single speed to 21-speed, meaning there are two gear systems, one on each side of the handlebars. It’s highly recommended that you choose a multiple speed system above 15-speed. 21-speed systems will give you everything you need for all terrains and journeys. This means that your child can take complete control while riding, whether they are tackling high hills or travelling down steep slopes. Whether your child is just starting out or they are an experienced biker looking for a new bike, there are some fantastic bikes available to make your child’s experience the best it can be. By taking the time to shop around and invest in the best bike for your child, your child can stay safe and healthy while enjoying a whole new world of experiences.